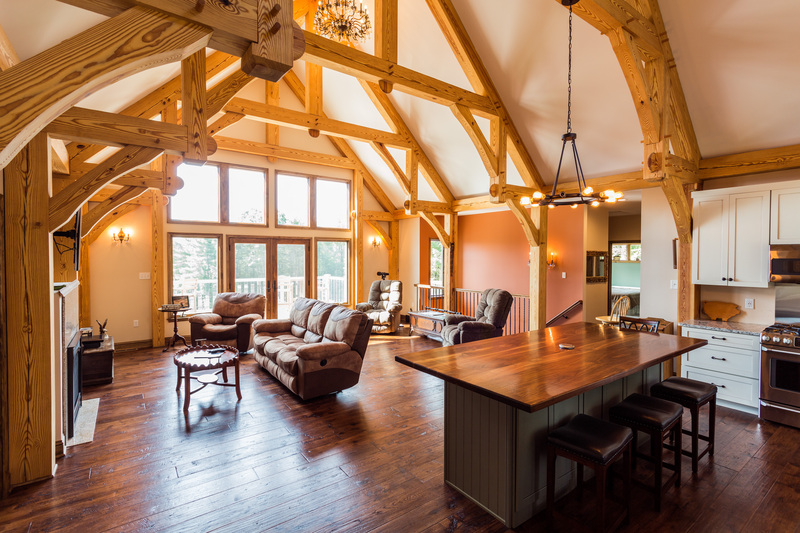 La Montage Timber Frame | RW Buff Inc.
A spacious mountain retreat overlooking the ski slopes was the owners’ dream that came true in this 2300 sq.ft. 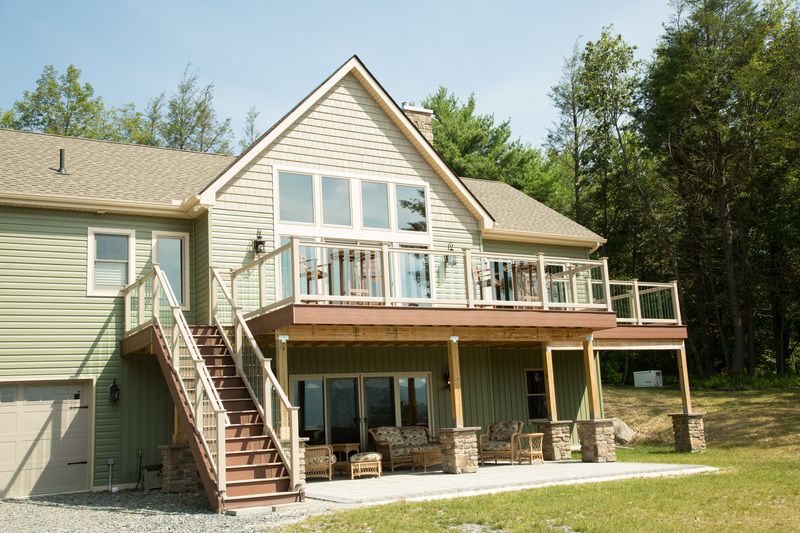 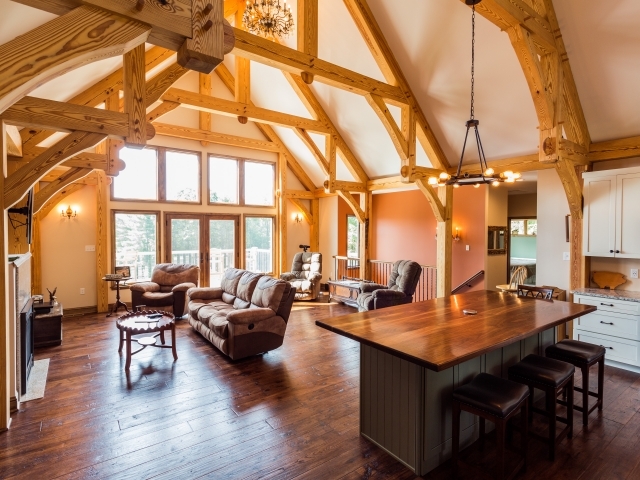 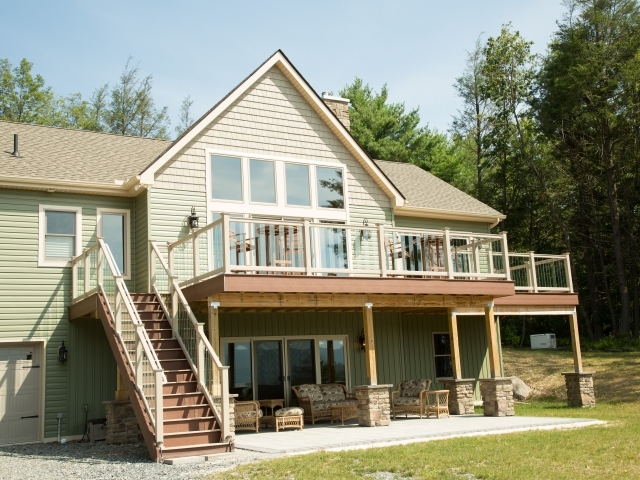 custom timber frame home, perfect for entertaining in any season. 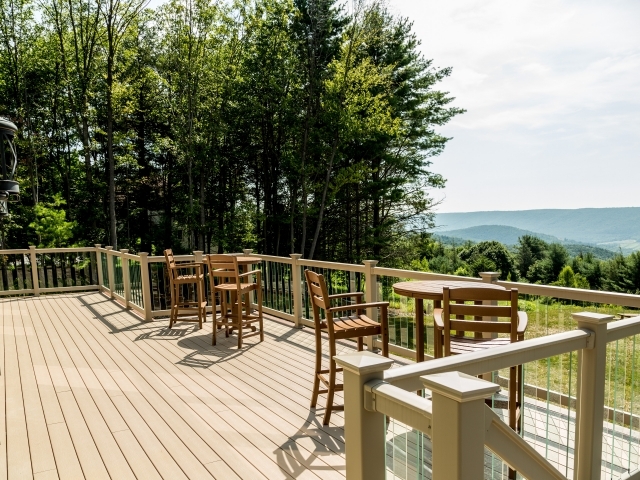 Several years ago, the owners purchased this property overlooking Blue Mt. 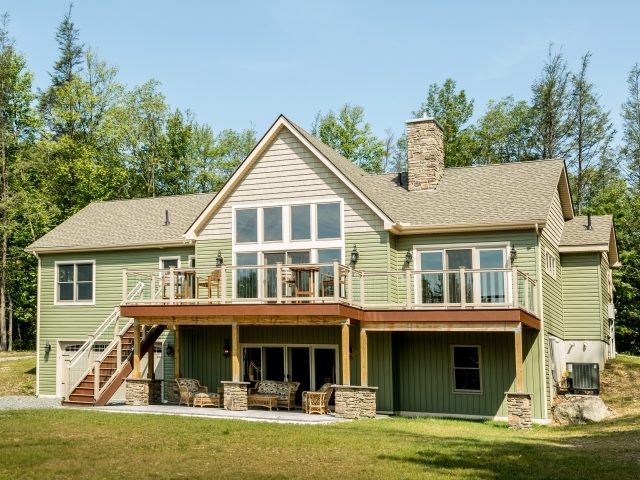 ski area with the vision of building a retirement retreat where they could relax and entertain family and friends far from the chaos of Wilmington, DE. 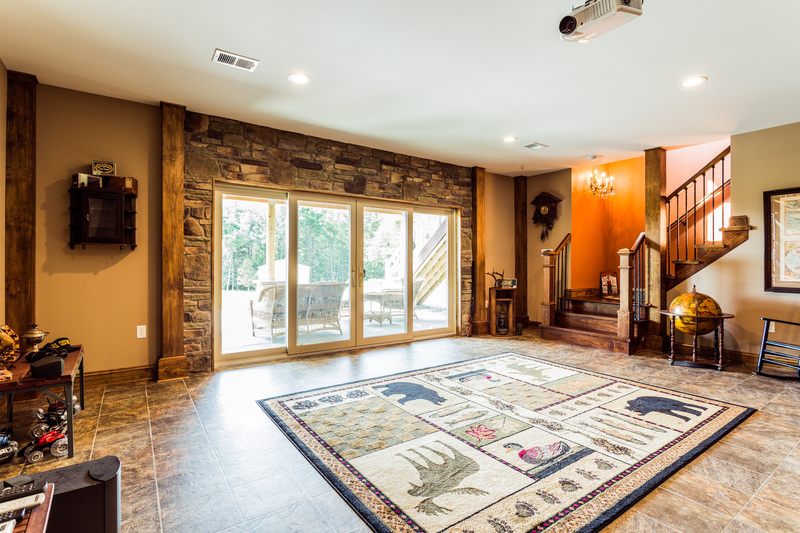 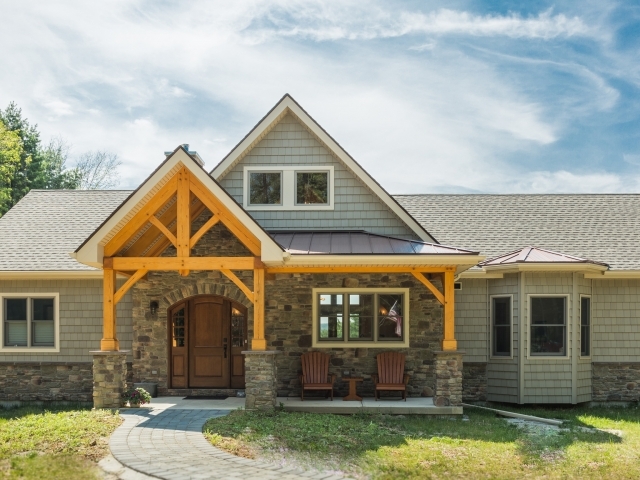 This custom timber frame design with its large stone & timber front porch, spacious great room and huge rear deck fit the bill perfectly. 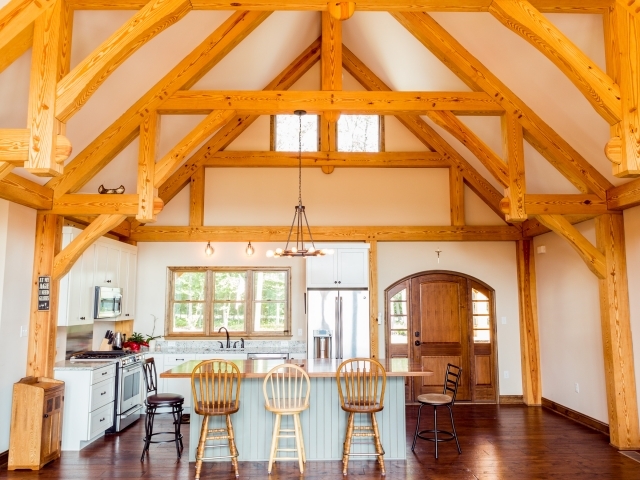 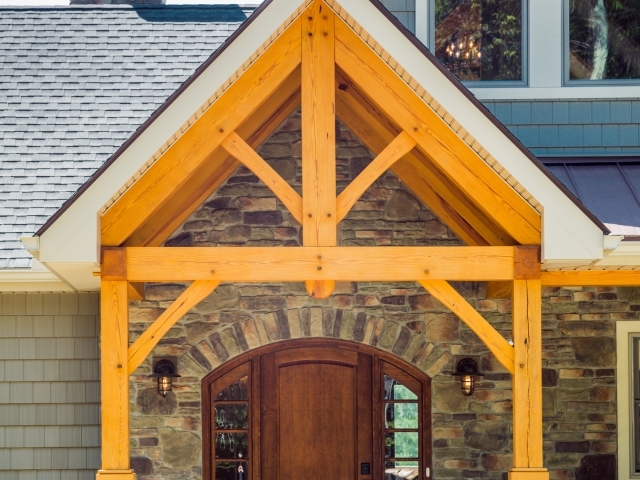 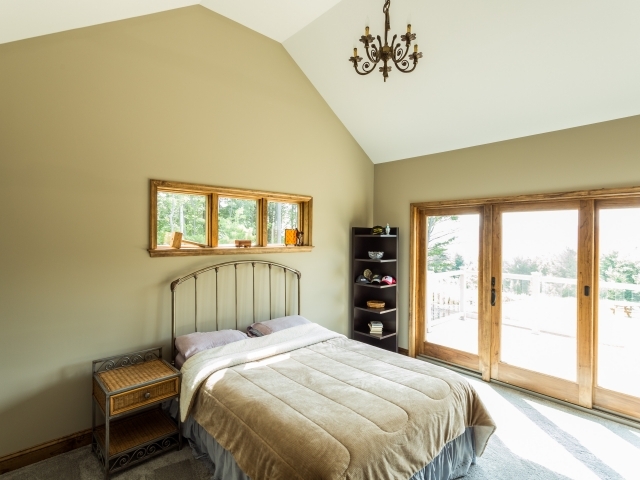 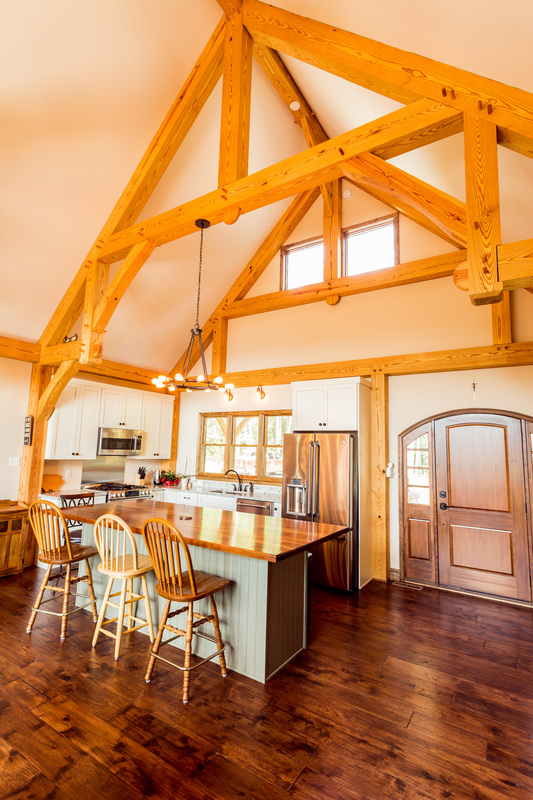 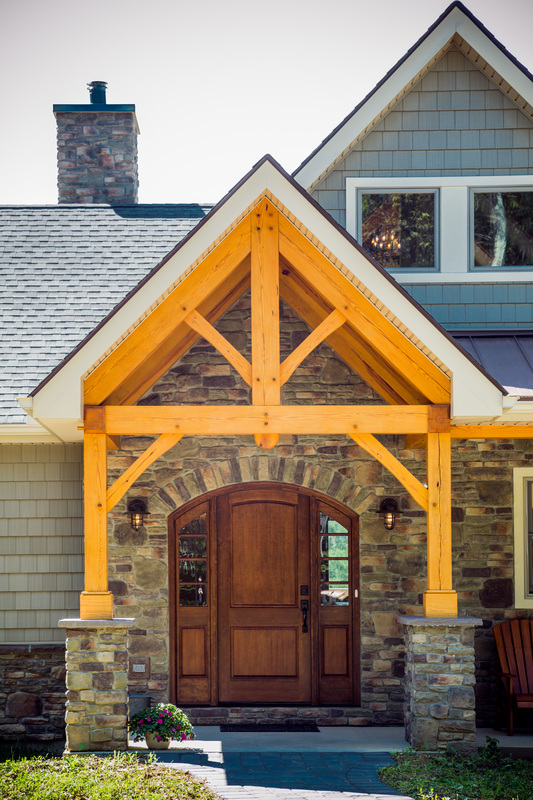 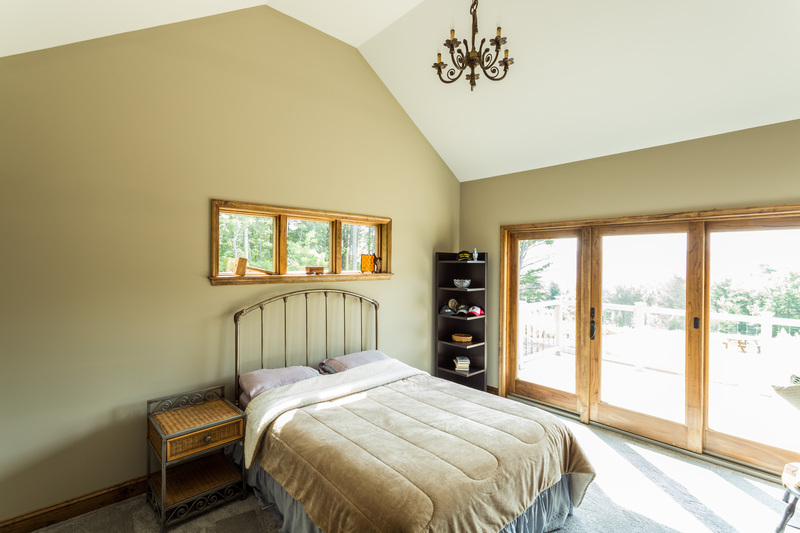 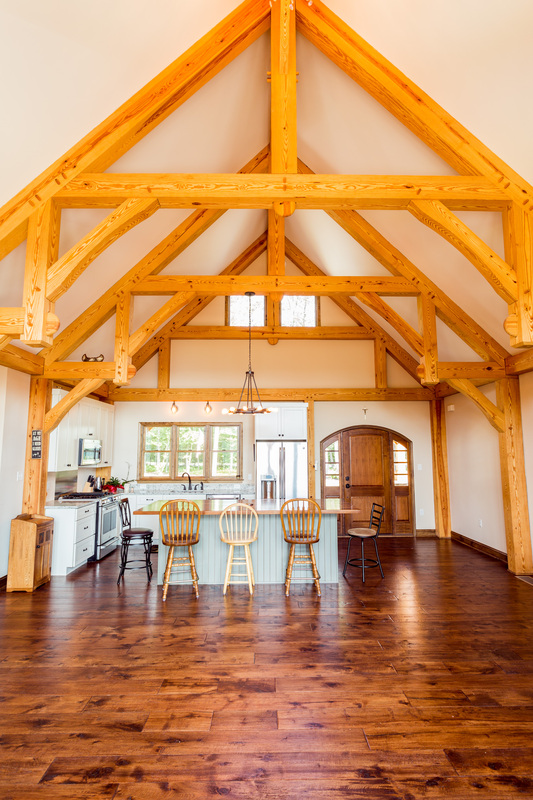 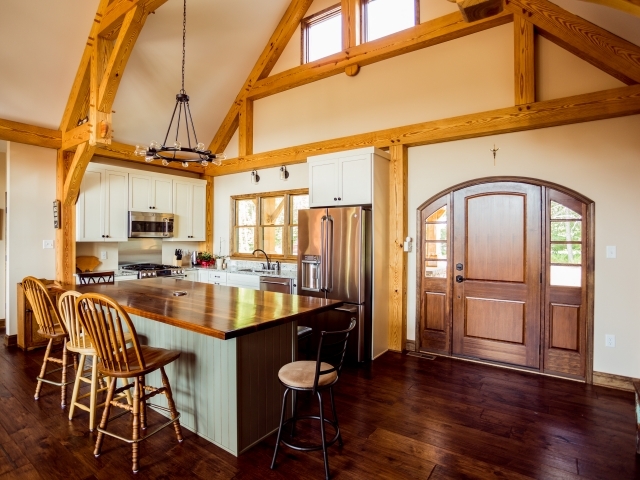 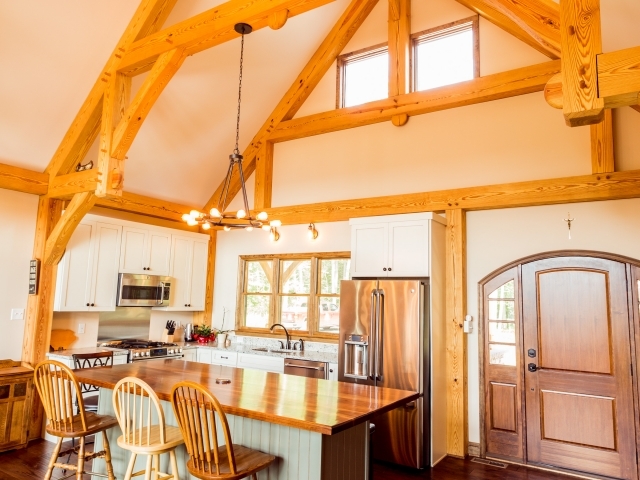 Upon entering the arched hemlock front door, you are greeted by a bright and warm vaulted great room supported by five large, traditional, timber framed hammer trusses of southern yellow pine. 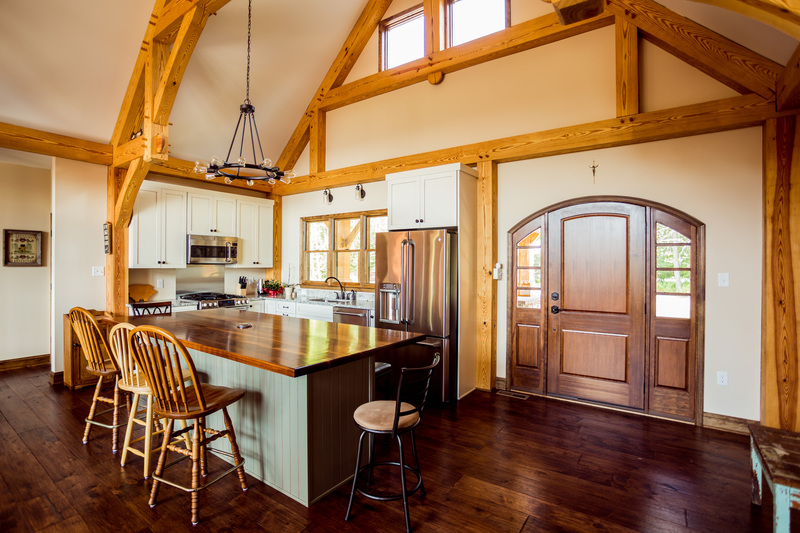 The great room contains a unique eat-in kitchen with painted cabinets and a beautiful walnut topped island table. 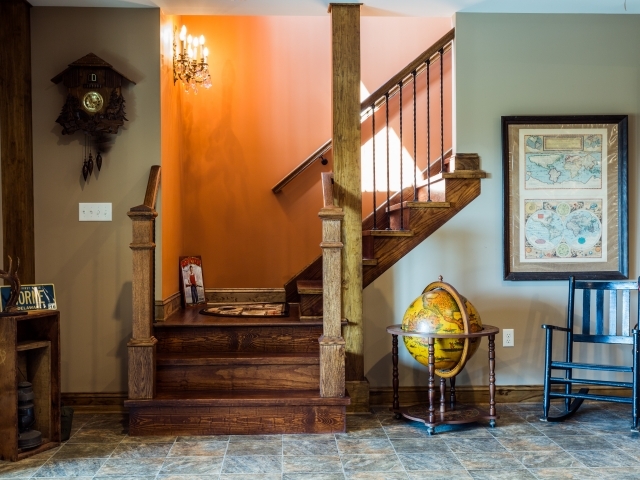 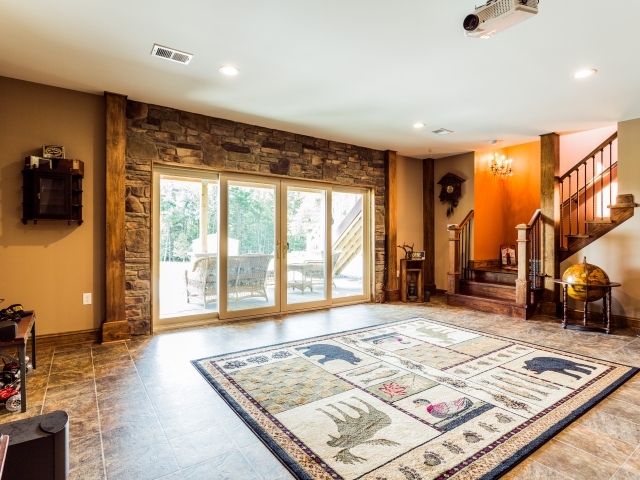 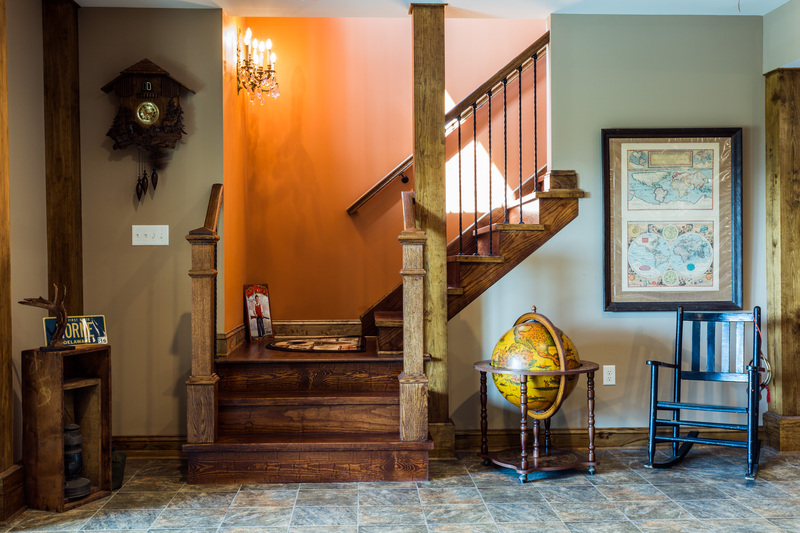 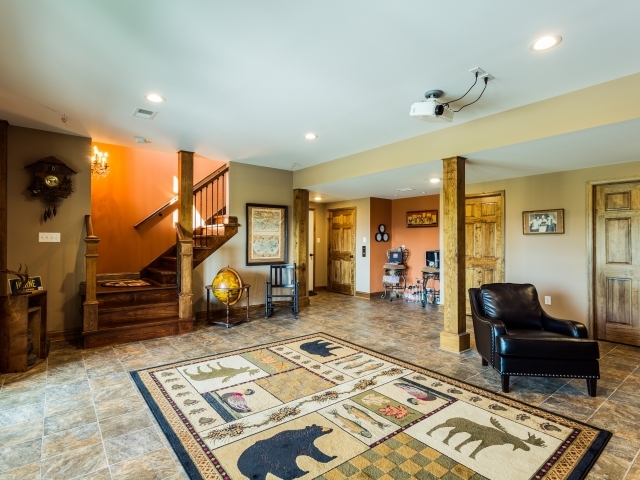 It also has a wall of glass with doors to the deck and an open oak staircase with iron balusters connecting to the family room below. 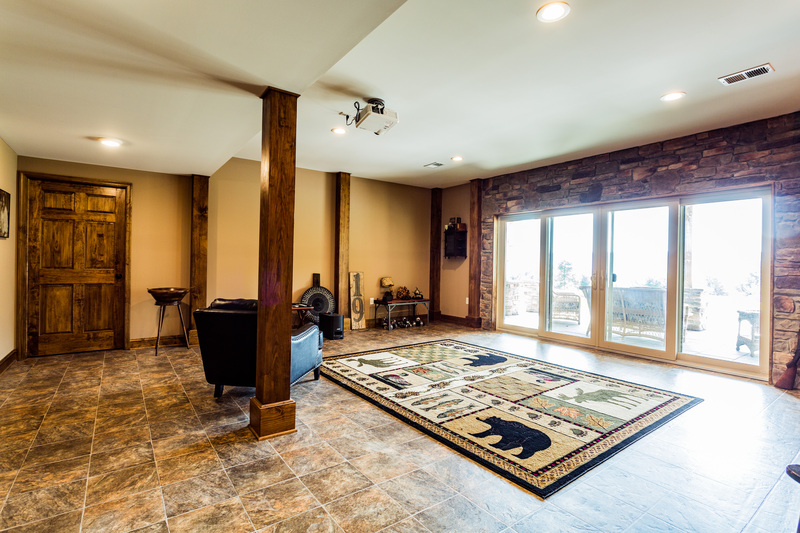 The master suite just to the left of the great room has views of the mountain and private access to the deck. 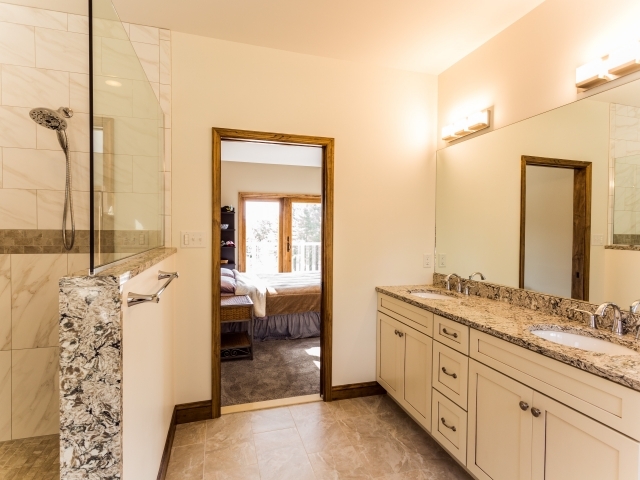 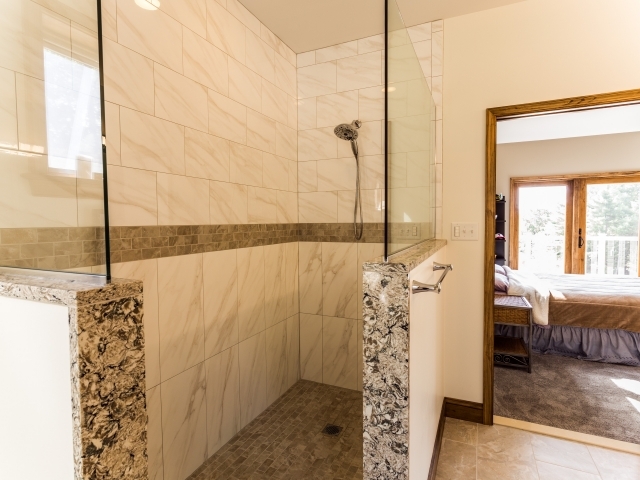 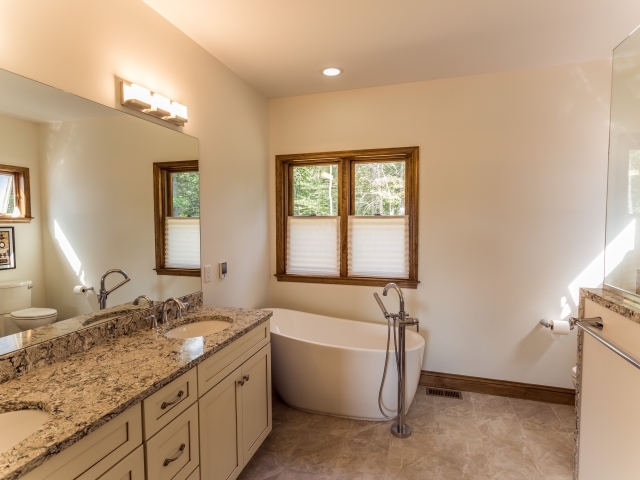 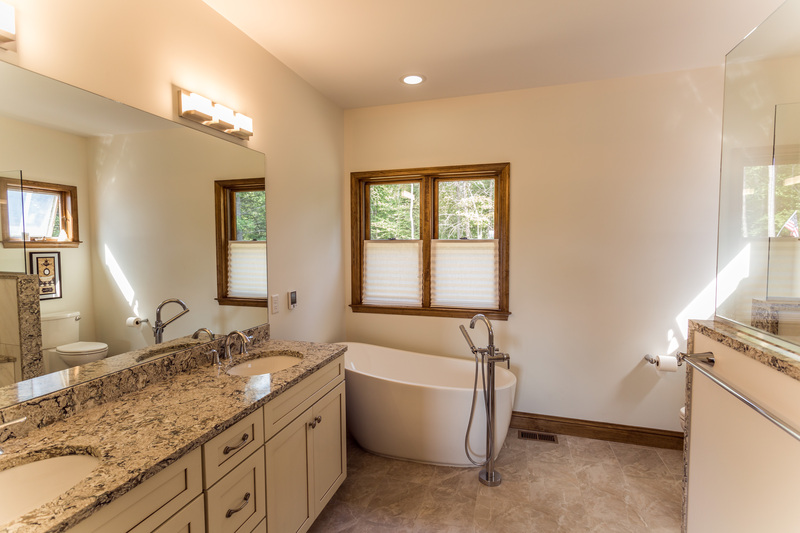 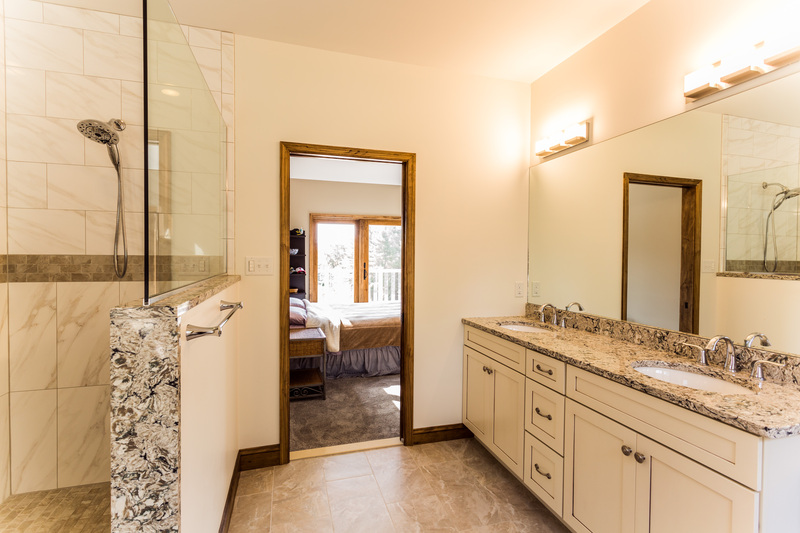 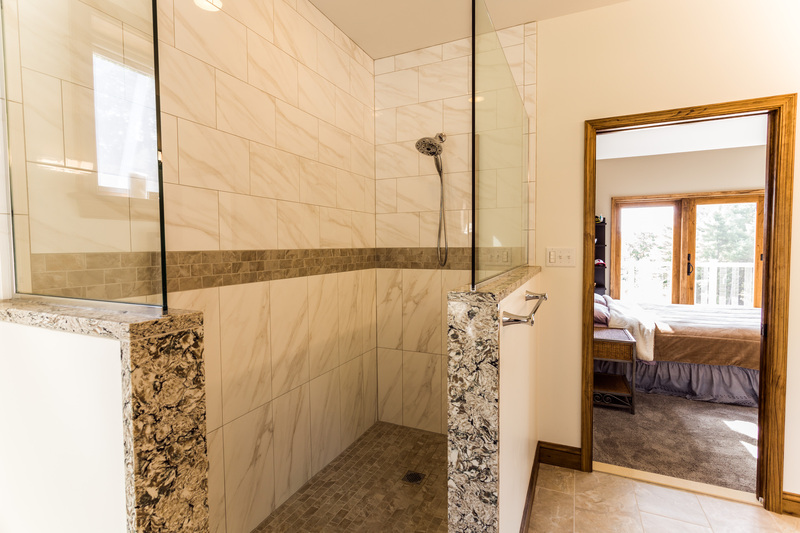 It also contains a luxurious master bath with soaking tub and walk-in shower of tile, marble and glass. 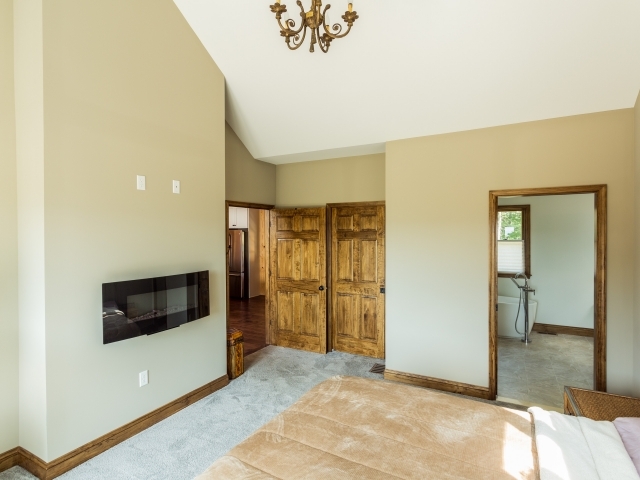 To the right of the great room are two guest bedrooms a small office and a full bath. 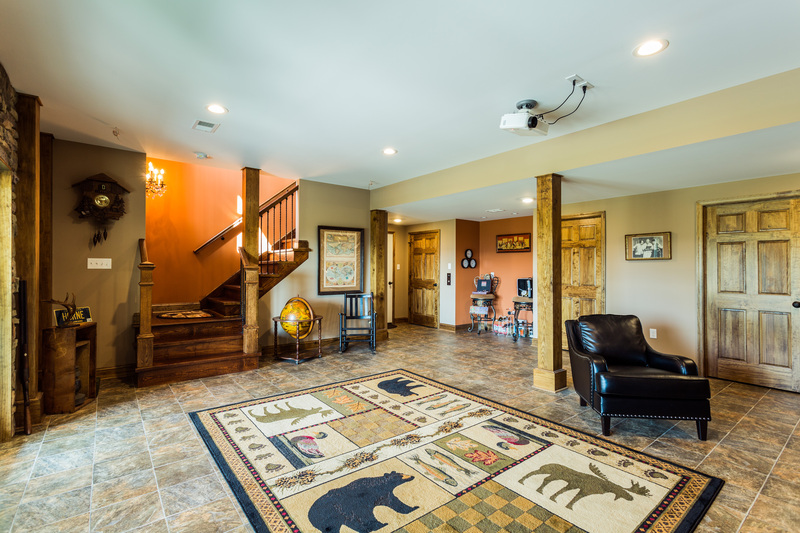 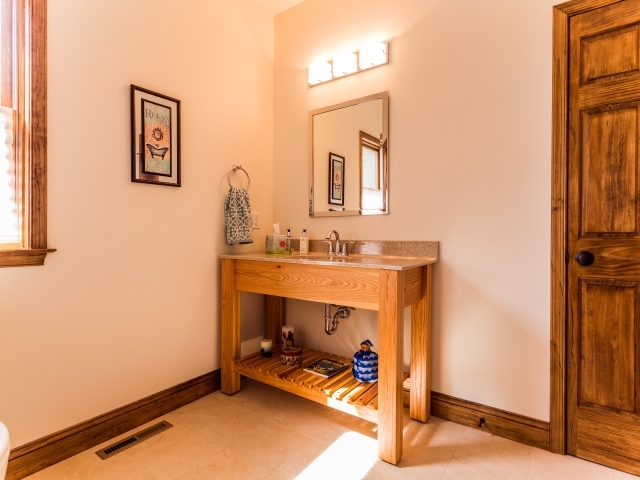 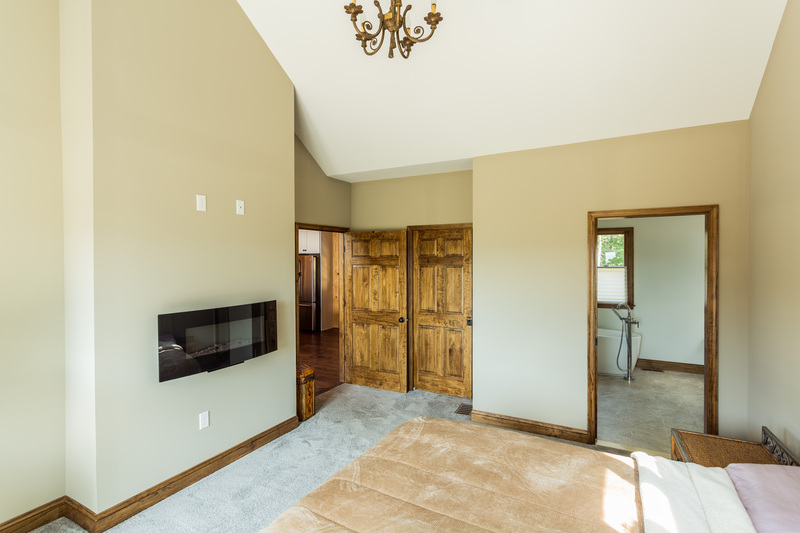 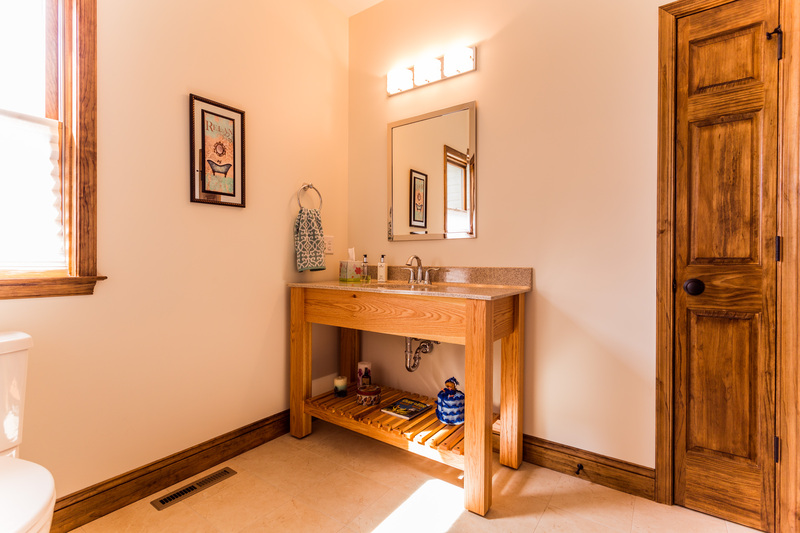 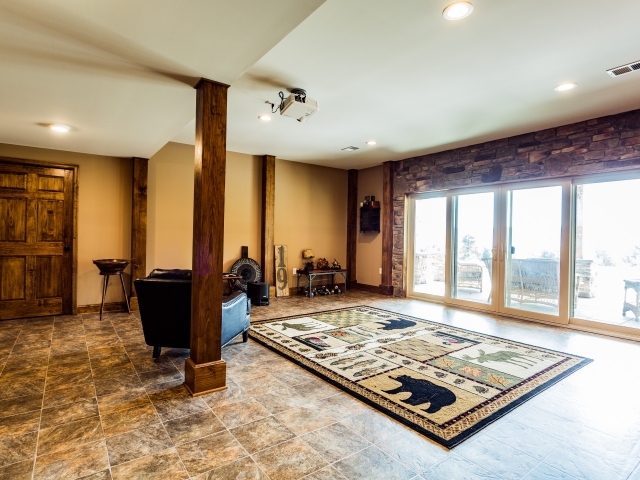 The finished lower level contains a family room with stone accent wall and exposed timber posts, a large laundry, a full bath and a two car a garage. 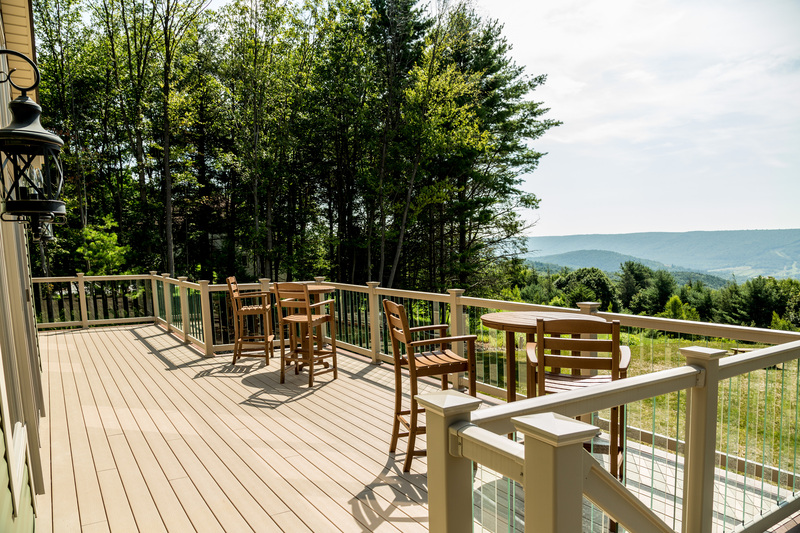 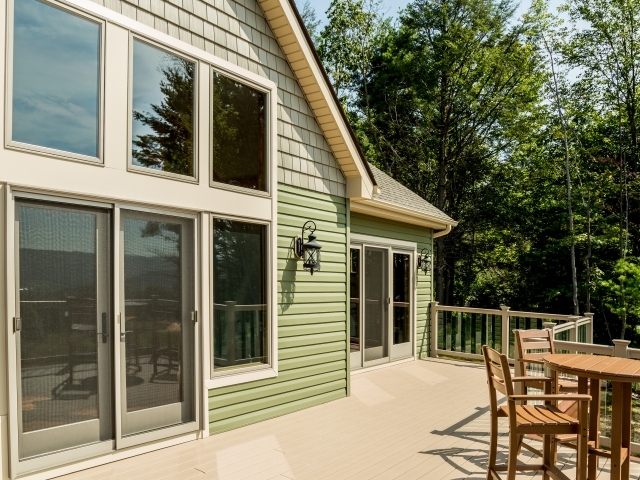 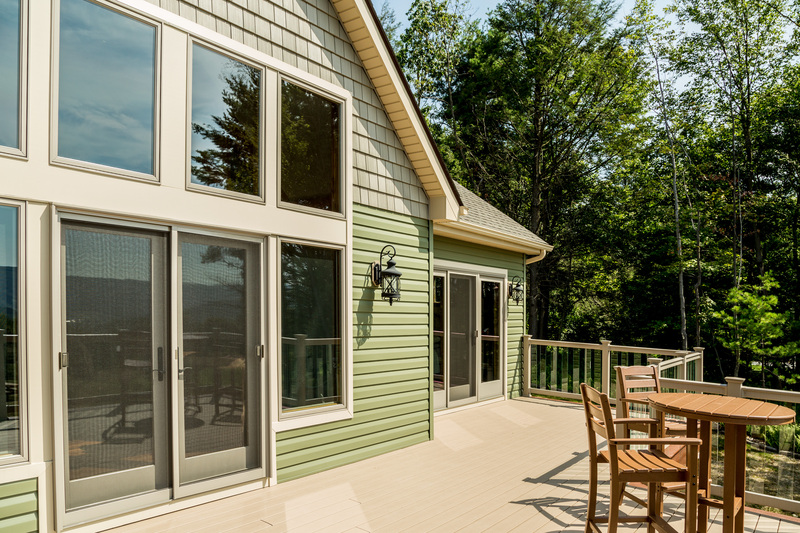 The rear deck has a spectacular view and boasts composite decking and glass railings. 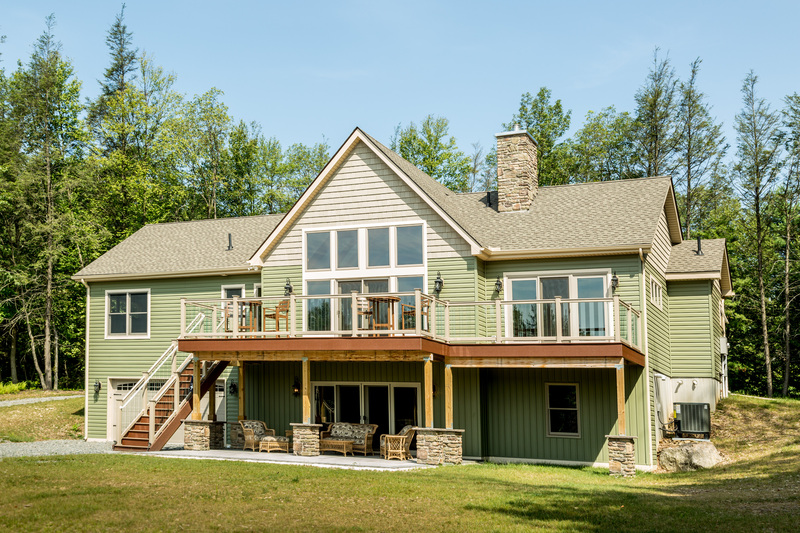 The home is also energy efficient with SIP panel roof structure on the great room, hybrid dual fuel HVAC system and Superior Wall foundation.